WILA Crowning systems fully compensate for the deflection in press brakes. This results in a consistent bending angle across the entire length of the machine. WILA New Standard Crowning Systems utilize a series of patented adjustable wedges known as Wila Waves. The accuracy of the bending process is determined by the tolerances along the Ty and Tx axis: vertical and horizontal axis. The Ty axis value is decisive in determining the parallelism between top and bottom tools. he Ty axis adjustment, which is normally incorporated into the bottom of the Crowning Systems and Bottom Tool Holder, is able to easily and effectively correct accumulated machine tolerance across the length of the whole machine. The Tx axis value relates to the position of the bending axis in relation to the back gauge, critical for producing accurate flange lengths. The Tx axis adjustment has been included in all Tool Holders suitable for press brakes featuring the Universal Press Brake (UPB) hole pattern. 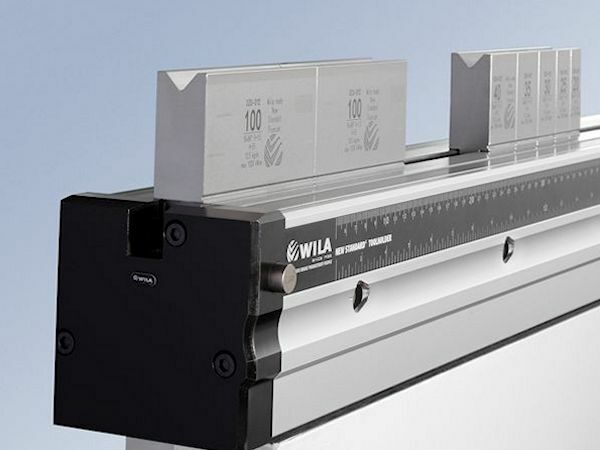 WILA's New Standard ‘HD’ Heavy Duty Tooling System is a new addition to our state of the art New Standard product line. It represents a system of Premium Tool Holders (Clamping and Crowning systems) that have been specially designed for high tonnage bending applications. New Standard Crowning Systems are based on the WILA Wave System. This opposing wave technology automatically supports dies across the length of the press brake. The different angles built into the waves automatically compensate for machine deflection from a single adjustment point. Lateral adjustments are also possible for correcting machine and tooling tolerances at specific locations. 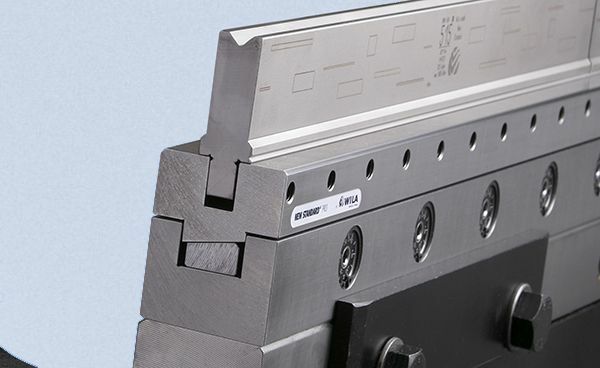 WILA offers these systems especially for press brakes that are not outfitted with built-in Crowning systems. They feature the same qualities and possibilities as New Standard Pro Crowning. Featuring B2 Tang on the bottom for mounting to existing groove in the lower beam (Image B2). B3 Bolt-down base for mounting to existing bolt-hole pattern on the lower beam (Image B3). Ideal for press brakes which do not require a crowing system, or for press brakes with a crowning system already incorporated into the lower beam. Compact design and fully integrated clamping system for bottom tools. Available with hydraulic or manual clamping. Precision ground for a high-quality finish, highest precision and maximum life. Bottom tools can be inserted from both sides. Available in a large variety of models and lengths and are offered at a very appealing price/quality ratio. Hardened Clamping pins apply individual pressure on segmented single V-tools as small as 15 mm. Manufactured from high-quality tool steel. Load-bearing capacity of up to 200 ton/Meter (with a minimum tool width of 45 mm).